The camera angle gets pretty screwy at times. Also, what the heck is wrong with Lajcik's face? This brings me to my second gripe. There are two fighters in the Octagon. One of them is a jujitsu man. The other is a wrestler. These are two vastly conflicting styles of combat. One should be all fluid moves while the other is a brute who simply tries to conquer his opponent with a variety of grapples. Instead, it's two guys who exchange a couple of punches before one pins the other and the inevitable victory is eked out. I suspected that I sucked, and wasn't emoting the kind of style an experienced player would. So I decided to watch several of the CPU battles. Their fights went exactly the same as mine. Even though the fighters move at different speeds and hit harder or softer, there's no real feeling of a particular fighting style. I suspect that movies have lied to me and in Real Life all fights are reduced to two guys pounding the daylights out of one another with no real flair. This is fine for Real Life, I suppose, especially since I didn't pay anybody $40 to experience Real Life, so there really isn't a complaint department with which to file my grievances. I did, however pay for UFC and I'd like a little style in my slobberknocker, thank you very much. These are supposed to be professional fighters, after all. The create-a-fighter mode is sorely lacking. You basically pick a fighting type, give him a name and try to play with a severely underpowered character to earn him skill points to buff his stats. That's pretty much it. None of the great wardrobe/skin/face/moves/etc choices players have been offered in recent wrestling titles. This entire feature feels as if it were tacked on at the last minute, and was never given time to be made fun. Search around and you'll find a cheat code for the create a fighter that gives you maximum skill credits at the start of the game. The interesting thing about the uber-fighter you will build is that he will still be handily beaten by the first competitor you put him up against in Contender mode. Looks nice. 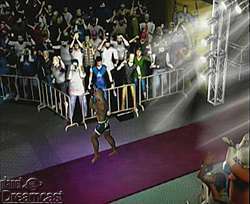 Too bad the crowd turns to sprites once the action starts. Then there's the lack of a continue feature. Why is it that when I lose the fight, I'm forced back to the main menu? I happen to think that a great number of players will simply want to keep on fighting after they lose a round. Instead, they are sent back to the main menu screen to start over from scratch. This isn't fun. Especially when we've all been trained by Capcom and Namco to expect the word "Continue?" to pop up. Another quick hit: where's the blood? It seems to me that when two guys are smacking the bejeezus out of one another, there should be some blood involved. I set the blood level option to max and still got little more than a Genesis-style red pixel flash. I want smearing on the mat. I want bloody noses. I want a blood setting that when put to max actually results in some freaking blood! What gore IS present isn't even that realistic, so I'm at a loss as to what the developers were going for here. I'll end this where I started -- the graphics. As wonderful as their models are, Bruce Buffer, the announcer and John McCarthy, the referee are plagued by Flappy Gums Syndrome. As their voice samples play, their mouths flap open and shut like some sort of highly stylized Mr. Mouth. With so many games now sporting realistic lip syncing, this just detracts from an otherwise beautiful package. Worse than Flappy Gums Syndrome, however, is the crowd. Yes, the crowd that made me feel so tingly is stolen away the instant the game begins. They are replaced with the same nasty two-dimensional sprites we've seen a million times in a million sports titles over the years. Once again, this wouldn't be so bad if we hadn't already been shown how cool the crowd could look, just moments earlier in the very same game! Going into UFC blind was, I think, a success. As awful a game as WWF Attitude was, I found myself still playing it because I got to play Mick Foley. My fandom got in the way of admitting it was a lame game. Not so here. 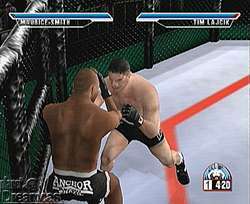 With UFC, I experienced a sub-par game with great graphics and a main menu that you get to see a whole lot of. Highs: Pretty graphics, good controls, great training mode. Lows: Every single fight is exactly like the one before it, there is no style or flair to the fighters, no continue mode. Other: 1-2 players, VMU Compatible (12 Blocks), Jump Pack Compatible, VGA Box Compatible.